Features extra-long stay-cool grips to keep your hands safely away from flames. 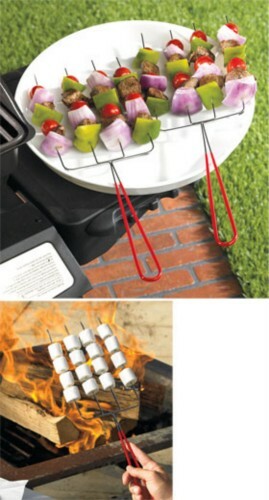 Each skewer has 4 long prongs that you can flip with one easy motion of your wrist. You'll get 2 in this set for quick and easy grilling. Perfect for grilling shish kabobs, vegetables and meats, they are also great for hot dogs and marshmallows around the backyard pit or campfire. The stainless steel prongs are built durable and strong to last. Both skewers measure 19-3/4" x 5-3/4"